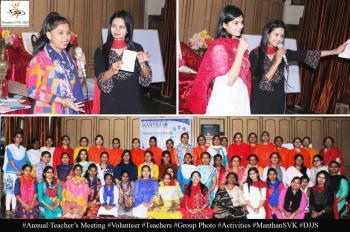 Manthan SVK organized a sponsor meet on 31st October 2015 at SAM International School in Dwarka. All the sponsors of the West Delhi region were invited to meet the beneficiaries and view their progress over the last year. The sponsors and guests were greeted and welcomed with chandantilak, flowers and garlands by the tiny tots of Manthan. The event commenced with lamp lighting by the dignitaries. Students of Manthan SVK, Dwarka presented a prayer through dance on Gaytri Mantra, saluting the balance in life that is created by the unison of physiological, intellectual and spiritual spectrums of a human life. The stage was then presided by the beneficiaries, who shared their experience on how Manthan SVK helped them and changed the trajectory of their lives. The audience applauded to their full volumes on witnessing their children’s progress. Students of Gurgaon and Dwarka centres of Manthan SVK also gave enthralling dance performances on ItnisiHassi and BamBambhole respectively. The vigour and enthusiasm of the students moved the audience and the guests alike. A skit in the form of fancy dress show highlighting the true heroes of India was presented by the students of Manthan SVK – Shakurpur. Also, an amazing performance on Sanskrit monologue and Sanskrit songs were presented by the students from the same centre. The young volunteers of YuvaParivarsewasamiti (YPSS) along contributed to the cause by presenting a sensational skit on them – Giving. The skit described the pitiable conditions of slums and remote deprived areas of our nation and how the responsible citizens can help this deprived segment of our society to overcome the obstacles in the path of their success and fulfilment of their dreams. 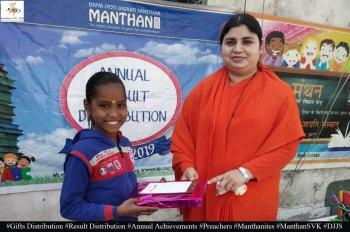 All the performances were highly appreciated by the guests and audiences, who were moved and deeply touched by seeing the growth that the students underwent after joining Manthan SVK. Swami NarenderanadaJi, secretary DJJS spoke at length on the initiative and how it is benefitting thousands of students across the nation. He enlightened the audience on how it was ShriAshutoshMaharajJi’s vision to create a platform for the underprivileged children and inculcate values in education so that the future of our nation shine and grow positively and constructively. SadhviDeepaBharti, program Cooprdinator, Manthan SVKspoke on the vision behind Manthan SVK and gave the entire credit of Manthan SVK’s success to the inspiration of ShriAshutoshMaharajJi. She thanked all sponsors for their prodigious support to the cause. The ending note of the program left every heart full of emotions, satisfaction, true happiness and gratitude. The sponsored children gave thank you cards to their second parents, i.e. the sponsors, touching their feet in reverence. Their second parents hugged, patted and embraced their adopted kids, their daughters and sonswhile receiving the returning emotions. Thereafter, everyone lighted the candles on the rangolis made by the students of three centres- Dwarka, Gurgaon and Paschimvihar. 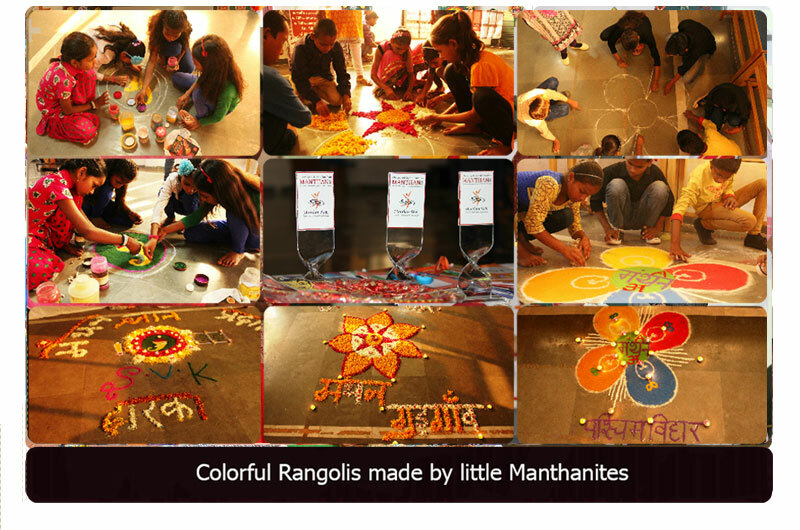 In Rangoli competition, Gurgaon center bagged first position whereas Dwarka and paschimviharcenters bagged second positions. Swami NarendranandJi handed over the winning trophies to the teams along with gifts as token of love.